I was sent this very informative article by a friend. 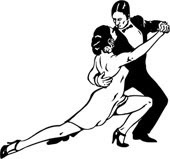 It discusses the expectations and guidelines of tango in social settings, including dance flow, inviting and declining invitations and more. There is also this article by Ney Melo from CloseEmbrace.com called Tango Etiquette: The Do's and Don'ts of Inviting and Accepting.